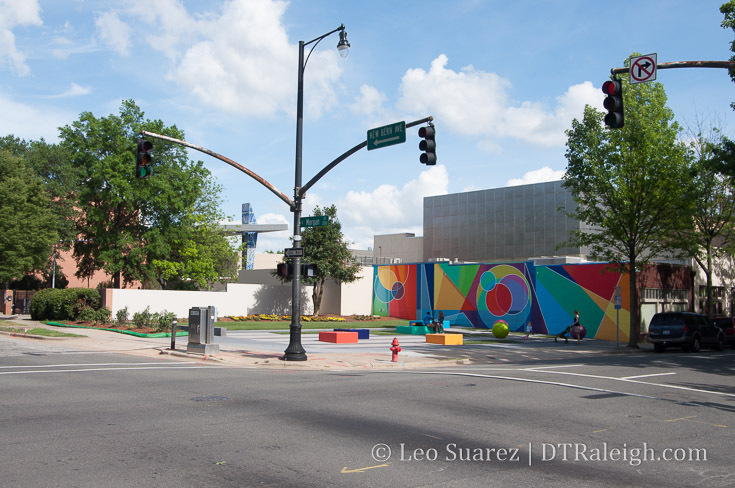 The corner of Blount and Morgan is looking very colorful these days. Marbles have demolished the car service shop here and, for the time being, installed this colorful mural and plaza. It’s a dramatic difference for sure and with evening shade is quite pleasant to walk through. With expansion plans on the horizon, Marbles is sure to grow and I can’t see it being a total shocker that this lot is a holdover for something much grander down the road. Kudos to the team behind this install though as it’s a great contribution to downtown’s public space! Very nice mural. I saw it in the “painters at work” phase, but didn’t notice it on my pm commute recently – too concentrated on watching cars as I pedal south on Blount. I’ll try to see it today.